Climate Change:- The projects that contribute towards the removing of cultural, institutional, technical and economic barrier to Energy Conservation and Energy Efficiency. These projects promote the adoption of renewable energy and sustainable transport system are all projects that are undertaken under climate change. Participatory, community-based assessment of local energy use, resources and alternatives. Energy audits of homes, buildings, hotels and factories lined to advocacy and training about energy efficient responses. Capacity building and awareness-raising activities about climate change and its repercussions at the local level, incorporating local knowledge about climatic history and patterns. Demonstrating projects involving the introduction of appropriate, renewable solar technologies at the community level: solar pumps for water purification and irrigation, as well as solar energy for cooking, heating and electricity. Demonstrating projects involving wind-generated energy for community and municipal needs. Biogas demonstration projects in appropriate context where there are incentives for sustainability. Collaborative community/academic research and development in order to produce low-cost sustainable energy options. Introduction of locally manufactured, improved cook stoves that reduce charcoal/fuel consumption. Reduce the use of motorized transport with net effects of cutting down on emissions from motor engines. With the help of National and Local governing bodies, implement projects both in urban and rural setting. Reduce emission of Greenhouse gases (GHG). Integrated ecosystem management: This is an operational programme that aims at catalyzing widespread adoption of comprehensive ecosystem management and interventions that integrate ecological, economic and social goals to achieve multiple and cross-cutting for local, national and global benefits. Creation of an enabling environment: appropriate policies, regulation, incentives, structures which are developed to support integrated ecosystem managements. Institutional strengthening: the capacity of institutions to implement integrated ecosystem management approaches through training and logistical support. 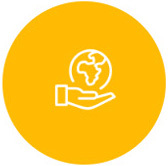 Investment which are based on integrated ecosystem approaches and stakeholder partnerships to simultaneously address local/national and global environmental issues within the context of sustainable development. The impact of climate change can be seen on various sources of human dependence such as water resources, agriculture and food production, health and the frequency of extreme natural calamities. The projects in India aims at preparing local communities to take action to prevent the impact of climate change and to leave green handprints.